What are the success rates with IVF? Are there any risks with IVF? 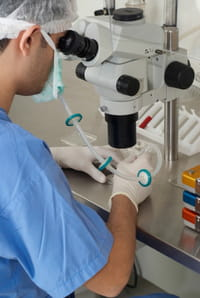 In vitro fertilisation, IVF, is the process where an egg is removed from a woman and is fertilised in a laboratory with a sperm obtained from her partner. This fertilised egg is then implanted into the woman's womb. It is quoted that 7,000 IVF babies are born each year. IVF babies are sometimes referred to as "test-tube babies" due to the methods used. Your GP or specialist will be able to inform you whether you will be entitled to IVF treatment on the NHS. You must ensure that you visit a reliable and qualified centre for your treatment to minimise risks and complications. You will be able to acquire more information from your specialist before treatment begins. Latest update on June 10, 2013 at 01:57 PM by Jean-François Pillou. This document, titled "IVF: In-vitro fertilisation," is available under the Creative Commons license. Any copy, reuse, or modification of the content should be sufficiently credited to CCM Health (health.ccm.net).